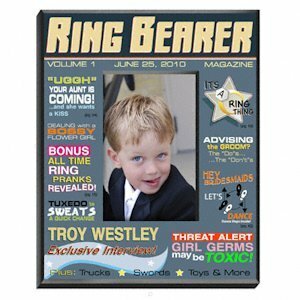 Honor the littlest member of you wedding party by placing his picture in the center of this Ring Bearer Magazine Frame! Decorated with fun article headlines, this frame measure 8" x 10" and holds a 4" x 6" photo. We even personalize the frame with the ring bearer's first and last name and date to really make him feel like a star!